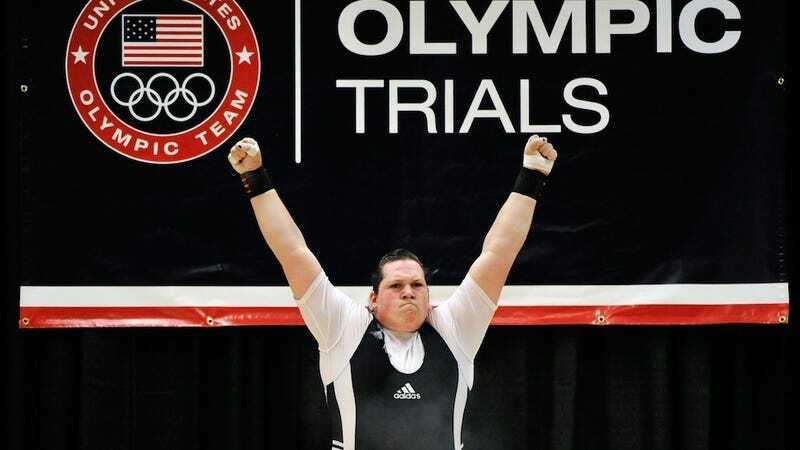 US weight lifter Sarah Robles is one of the strongest women in the world, so it's extra admirable that when she was living on a paltry $400 per month stipend as she trained to compete for the US in the upcoming Olympic games, she didn't resort to using her formidable muscles to intimidate people into giving her their wallets. Nope — Robles kept her nose to the grindstone. Now, a tech company has taken notice of her strength in the face of adversity and agreed to sponsor her. Sarah Robles can lift 568 pounds. That's not quite enough strength to clean and jerk a Smart Car, but she could probably push a SmartCar up some stairs, into a third floor walk up, if you lived in a place where for some reason you needed a Smart Car inside. She leaves for London tomorrow. Credit for getting Robles noticed goes to several bloggers, but most notably to Think Progress, which launched a petition to get Nike to sponsor the 23-year-old athlete. And yesterday, Solve Media, a web advertising company, announced that they'd be partnering with Robles. But it's not a pity case; a company representative called it "doing the right thing."